Prenatal care is an important part of a healthy pregnancy. Did you know The Camrose Primary Care Network (PCN) offers prenatal care, and has expanded its prenatal services to now offer a complete 0-40 week prenatal clinic? This means as soon as your pregnancy is confirmed, you can start accessing prenatal services for the entire duration of your pregnancy. With the expanded prenatal clinic, you may now also self-refer or a referral may be sent from a family doctor. The Camrose PCN Prenatal Clinic includes a team of family doctors, registered and licensed practical nurses, and other healthcare providers who are committed to providing women with quality care and education throughout the duration of their pregnancy and delivery. The team carefully monitors you and your growing baby throughout your pregnancy, and is there for any concerns you’re having about your pregnancy. The Camrose PCN Prenatal team also works together and collaborates with and/or refer patients to the obstetrician or other specialists and community providers (i.e. Public Health), where needed during your pregnancy. One of the family physicians which see you at the Prenatal Clinic will deliver your baby at Covenant Health, St. Mary’s Hospital, and check in on you and your baby in the hospital. Once you and your baby go home, you will return to your family doctor for post-delivery care. A complete prenatal record will be available for your family doctor’s review prior to the scheduled 6 week follow up appointment. If you do not have a family doctor, you will be assisted early in your pregnancy to find one so you can more easily access postpartum care for you and your baby after discharge from the hospital. The Camrose PCN currently has five family physicians providing care at the PCN Prenatal Clinic, including Dr. Anderson; Dr. Els; Dr. Otto; Dr. Torok-Both and Dr. Amber Jorgensen, the Physician Lead for the Prenatal Program. “The option is now in the hands of the patient with the new 0-40 prenatal programming,” states Dr. Jorgensen. “They can see their family doctor for care in the early part of their pregnancy if that is what they are used to, or they can now come and see the multi-disciplinary team approach at the PCN. We are happy to offer services to everyone, and help them access the resources they need throughout their pregnancy”. 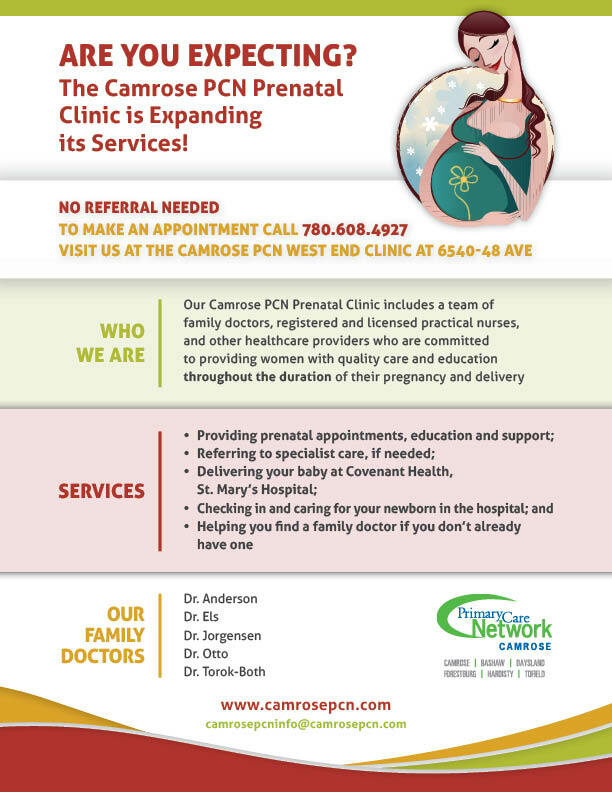 To self-refer to the Camrose PCN Prenatal Clinic call 780.608.4927 or visit us at the Camrose PCN West End Clinic located at 6540 - 48 Avenue in Camrose. For more information please contact the Camrose Primary Care Network at 780.608.4927. (Photo Above) Prenatal Clinic Patient Taylor O’riordan– surrounded by her team of healthcare professionals. Left to right Pam Sherman, RN middle back Amanda Oldenburg, Behavioural Health Consultant, Rani Fedoruk Registered Dietitian and seated in the chair is Dr. Amber Jorgensen, Prenatal Clinic Physician Lead.